Each member of the Club accepts the responsibility to protect the interests of the breed by conducting themselves in a manner designed to reflect credit upon them as an individual, the Borzoi breed, and on the Borzoi Club of America. To apply for membership, download the Applying for Membership PDF and also download the Membership Application and complete it per its instructions and mail to the BCOA Recording Secretary (shown on the application). The application should carry the endorsement of two BCOA members who are in good standing. Each sponsor must send in a completed Sponsor Form. 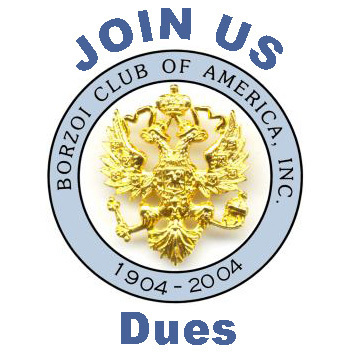 Each individual applying for membership shall receive a copy of the Code of Ethics and the Guidelines for Breeders of Borzoi and, in joining the Borzoi Club of America, thereby signifies acceptance of the Code and Guidelines in their entirety. Any documented violation of the Code or Guidelines shall be dealt with as provided for in the Constitution and By-Laws of the Borzoi Club of America. As of 11/28/02, foreign membership (outside North America) does not carry voting privileges and therefore, sponsors are not required. To apply to become a Junior Member, download the Applying for Junior Membership Information PDF and also download the Junior Membership Application and the AKC Code of Sportsmanship. You can also read this informative article on the AKC website. Further information on Junior Members is located in the Programs section of this website. The title of Life Member is automatically conferred upon each person who has been a member in good standing for 25 consecutive years or for 35 years, not necessarily consecutive. Life Members enjoy all of the privileges and responsibilities of membership but are exempt from payment of dues. You may view a listing of BCOA's Life Members here.